Another delicate and a very rich sweet dish which she used to make very often. I remember I had so many tries to have my hands set on this That’s why I say it’s delicate : ) This was a must on Eid, but also when we had guests Mom used to make it in no time. it shouldn’t be sticky, just that u can part uneven small pieces of it. they will puff up as u fry them take them out and lay on a kitchen paper. I have no specific time to tell its just according to your eye feeling.... get me?? Heat Ghee, throw in cardamom seeds to splutter. 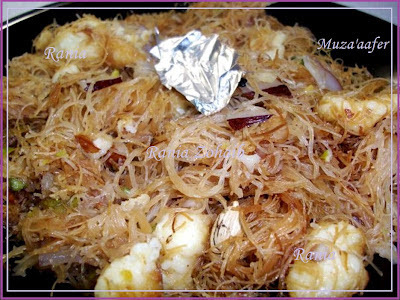 Fry the vermicelli light brown. Sprinkle few drops over it to make it a bit soft. Make the sugar syrup in a saucepan with 2-3 threads of saffron. Just give one to two boils. 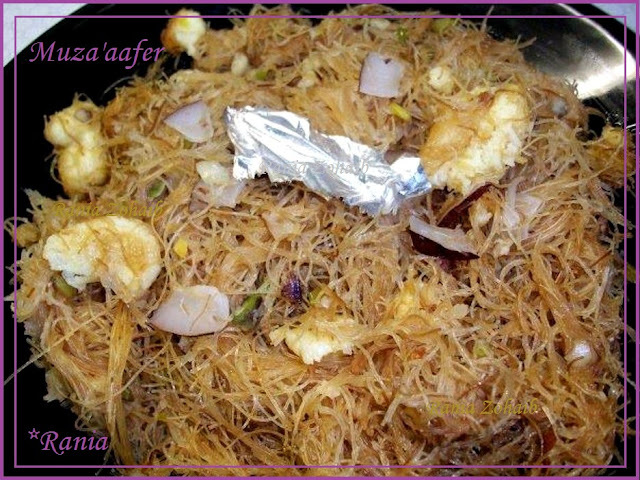 Pour the syrup over the fried vermicelli and mix thoroughly. Spread the grated/crushed nuts all over and the rest saffron threads. Spreads the khoya over all don’t mix!! Cover the lid. Put it on a low heat they will become fluffy in the steam.. ATTENTION: don’t use a stainless steel pot or pan, as the vermicelli sticks very soon and will become crusty!!! And we want it to be soft and fluffy!! !